Speaking of remakes, here’s a film that was recently (well, 3 years ago anyway) remade, causing a sort of renewed interest in the original series. 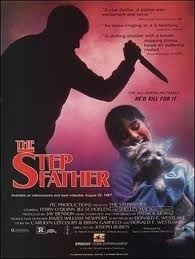 I say “series” because “The Stepfather” spawned not one, but TWO sequels !! Admittedly only the first two starred Terry O’Quinn and were released theatrically, but still, two !! As you probably know by now, this film is about a serial killer with an obsession towards finding the perfect family, at all costs !! He has repeatedly juggled lives / personas / families in his quest to live a “perfect” life. Will his lies finally catch up with him ? Will he find his perfect life ? Is it the guy from Lost ? I had heard a lot about this film before seeing it, mostly about O’Quinn’s performance towering above the film while also justifying it. I certainly remember seeing the VHS box for this one when I was younger, but it never really intrigued me enough to check out until now. 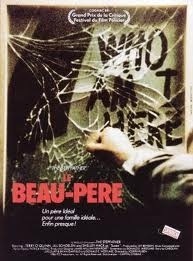 Also I kept confusing it with “The Paperboy” for some reason (http://m.imdb.com/title/tt0110770/). 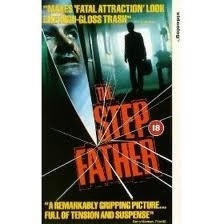 As advertised, O’Quinn is quite good as the chameleon-esque Stepfather. His metamorphosis between personas is quite something to watch. The rest of the cast is hit and miss, but interestingly (to me anyway) “Popcorn”s Jill Schoelen plays his new stepdaughter. Neat Horrorthon tie-in, no ? I’m not sure how to feel about this film actually. On the one hand it’s a reasonably well directed thriller with a great performance from its lead (which is really all you can hope for in a film I suppose). On the other hand, it didn’t really stick with me much. I was almost rooting for him to succeed in killing his somewhat irritating new family actually. Fans of “Lost” no doubt flocked to this film in the wake of his emergence on that show (or the release of the supposedly awful 2009 remake) and he is certainly worth watching. Clearly he enjoyed the role enough to return for the sequel (interesting, since he doesn’t seem to survive this one. Spoiler), though I’m not sure ill ever get around to that one. 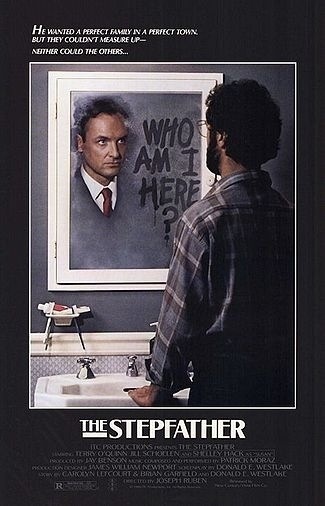 Probably the best part of the film is the famous “Who Am I Here ?” scene in which O’Quinn tries to cover up the fact that he quit his job (to move onto a new life / persona) by blaming the new receptionist for not knowing him. His wife suggests that maybe she forgot his name (Jerry Blake). He blurts out “HODGKINS !! What’s to forget ? !”, much to his wife’s confusion. It’s a mildly amusing / unsettling moment to be sure. The film was a box office success, partly due to O’Quinn’s well reviewed performance (even Ebert liked him !). This made it necessary to explain away the ending in the sequel. They cleverly decided that he was in fact unconscious and not dead, thus he was placed in a mental hospital which he then escapes. It was originally given an X rating, which is funny because the producers (the Weinsteins) insisted that more blood be added, much to the directors’ chagrin. Ironic that their meddling was largely cut out of the film in order to assure an R rating. As convenient as that sequel setup is, it’s nothing compared to the “clever” premise of the (much) lesser known third film (which even O’Quinn knew to avoid). 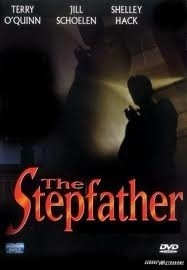 In that one The Stepfather once again escapes from the same mental hospital (crack security team there no doubt) and, so as to explain away the lack of O’Quinn, immediately gets plastic surgery. It’s as clever as it is terrible. The premise I mean, I’m sure the movie is all terrible. In closing, I very much respect O’Quinn’s performance in this film. 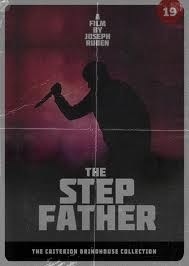 He brings it up from the potential “direct to video” prospects of the story and keeps you interested. There isn’t really a lot of replay value (despite likely being the best of the four films) and I can’t really regret passing over this in favour of other films in my youth. That said, I’m certainly glad I saw it, I just can’t fully reccomend it. 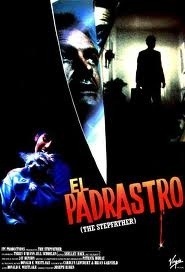 This entry was posted in Reviews and tagged 2012, classic, cult, franchise, friendo, Halloween, Horror, lost, October, Remake, review, Scary, slasher, stepfather, terror, thriller by lazron. Bookmark the permalink.